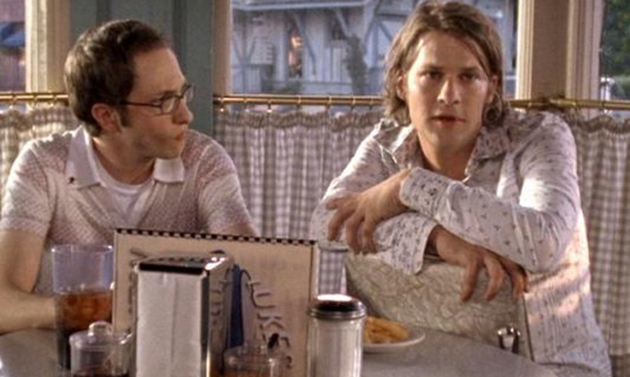 The world of "Gilmore Girls" would be incomplete without fictional band Hep Alien. Aside from giving viewers the opportunity to rock out with Rory's best friend Lane Kim on drums, the group played an integral role in shaping the tone of the music-obsessed show. 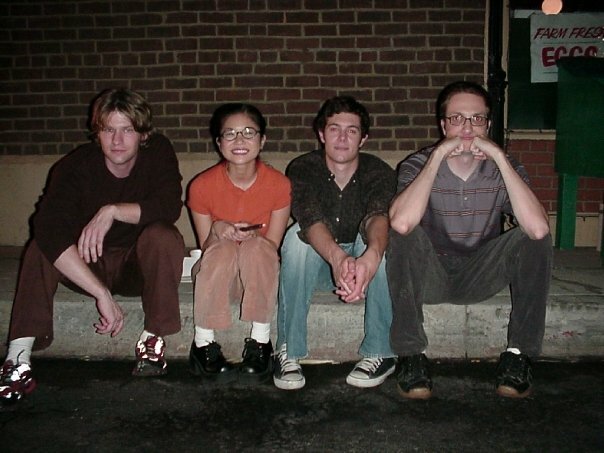 In honor of the series' recent resurgence in popularity on Netflix -- and because we all loved Hep Alien's reunion performance at ATX -- The Huffington Post caught up with former cast members Todd Lowe (Zack), John Cabrera (Brian), and Keiko Agena (Lane) to get some behind-the-scenes information about the band. 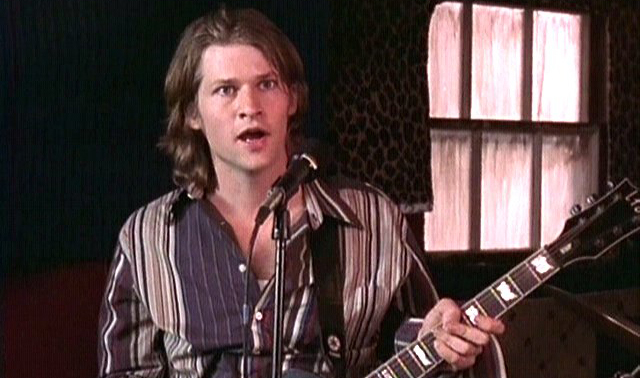 We also reached out to Adam Brody, who played dreamy band member Dave Rygalski before departing to star in "The O.C." 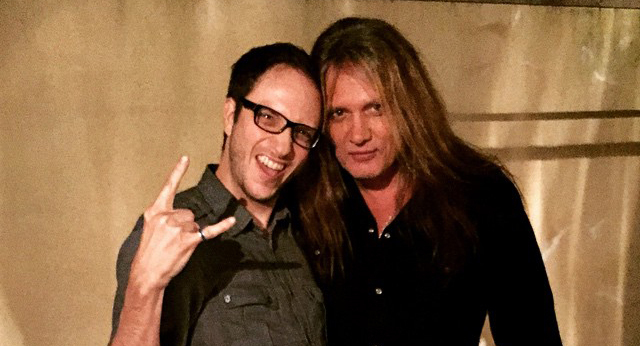 and true heavy metal rocker Sebastian Bach, who joined the band, and show, as his replacement. However, for some truly inexplicable reason, they did not get back to us. 1. The band members could all sort of play, but musicians were offscreen to provide the main audio. Cabrera, who played Brian, "didn't play the bass at all" when he first got the spot in Hep Alien, but did eventually learn enough to finger bass lines. After receiving drumming lessons, Agena joined Lowe -- one member who actually knew how to play his guitar -- in playing an instrument for real. Bach, "for all of his rock 'n' roll charisma, barely knows how to hold a guitar," as Lowe explained. "When he'd be faking it and tapping on the fret board -- it was just so funny to watch him do that." The members of Hep Alien did sing the songs with their own voices, but since there were varying levels of talent on the instruments, two musicians played the songs offscreen to provide the bulk of the sound. The bassist brought on was the real Dave Rygalski, Amy Sherman-Palladino's friend and the basis for Adam Brody's character of the same name. At first, Cabrera explained, the idea was for him and the other band members to learn their parts well enough that they could record in a studio and then mimic those tracks on camera. But, Sherman-Palladino and her husband, Dan Palladino -- who also produced, wrote, and directed for "Gilmore Girls" and "goverened our little band storyline," as Lowe said -- wanted "that authentic sound," and so they decided to always have Hep Alien play on set. 2. Cabrera was actually very much like his character, Brian, while filming. "One of the big personal themes I remember from shooting the show," Cabrera told HuffPost, "was that I was always having these funny moments getting hurt somehow ... which I guess is actually very Brian." Cabrera seems to have had a hard time dealing with shoots that involved repetitive consumption, as shots had to be retaken. One story he mentioned involved a kitchen scene where he had to come into the shot brushing his teeth and then spit into the sink. This shot required "around a dozen takes" and "at a certain point, my mouth felt like it was on fire, and I looked in the mirror and my gums were actually starting to bleach!" The food was similarly a problem, as he "used to really dig into the food [the actors] would have to eat for shots." Particularly memorable dishes were the Korean New Year food, the donuts at Luke's after Hep Alien's tour and the peanut butter and jelly sandwich before a house party gig. These all required similarly repetitive shoots and "by the end, [Cabrera] had eaten way too much." 3. Bach accidentally kneed Cabrera in the groin during a fight scene. The pain inflicted on Cabrera occasionally escalated beyond a sore mouth and a swollen stomach. For one scene, Bach and he had a "big fight" that required practiced choreography a whole week beforehand. After working with fight choreographers and tons of rehearsals, the two thought they had it down, and so Sherman-Palladino and Palladino were called to watch the final rehearsal. With the added adrenaline of their bosses watching, Bach accidentally kneed Cabrera right in the groin, causing the actor to collapse. "I was just in the fetal position," Cabrera recalled. "Everybody watching, including Amy and Dan, were like, 'Ooooh.' And I was like, 'Ehhhhhh.'" Bach quickly apologized, saying "Oh dude. I'm so sorry, man. I'm so sorry." During Lane and Zach's first kiss, Cabrera was also injured, as Low had to lift him up and throw Cabrera over his shoulder. "In order to get the positioning right, my stomach was digging into his shoulder," Cabrera explained. "We did the scene about 10 times and, by the end, I was actually starting to pass out." 4. The cast were all excited, but had mixed opinions when they heard Bach would be replacing Brody. When Lowe got the call that Bach would be replacing Brody in the band, his reaction was "Really!? That guy I saw open up for Bon Jovi back in 1990?" But Bach quickly proved himself to be a worthy addition to the band. Lowe recalled the first day, when Bach came to set as "a bottle of energy and uncouth[ness], but in a charming way." Lowe continued, "He's very loud. He said, 'Right on! This is the craft service?! This is fantastic!'" The cast became close friends with their new bandmate. "Sebastian's the best. I adore him also," Agena told HuffPost. There were also perks to being new friends of Bach's. "I was proud to even go out and be with this big rock star, so it kind of opens the door to some of that Sunset Strip rock-star scene, that I'd never really experienced," Lowe explained. "And to have ... to go in there walk in with him and be treated like a VIP was a cool feeling." Whatever club doesn't treat a member of Hep Alien as VIP -- even without Bach -- should be shut down, but that's beside the point. 5. Cabrera jokingly told Bach he hated him, because Cabrera used to sit behind a crush in Algebra who wore shirts with Bach's face on them. Cabrera and Bach became particularly close, and so the actor told the singer about his first impressions of Bach from back when he was a student. I actually used to tease him, I used to say, "Dude, I used to absolutely hate you." And he was like, "Why!?" And I said, "Because I used to have a huge crush on this girl, who sat right in front of me in Algebra. And she used to be in love with you. She would wear these shirts with your face on them and I had to stare at your face every day in this class." And he just was like, "Dude, I'm soo sorry." 6. Brody's departure was between seasons, and so the cast was unsure what would happen to the band. 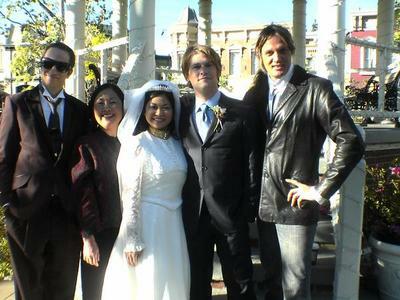 Since Brody's departure happened after the first season of Hep Alien's existence, the group wasn't sure if they were going to get written out of the show. Originally, the actors had been brought on with the assumption this would be a role that only occurred sporadically, so losing the frontman appeared dire. Sherman-Palladino and Palladino eventually told the cast at a party that there was a plan to replace Brody with a "hair metal band member," which Hep Alien's members were obviously psyched about. A bit later, Bach was hired. Lowe also commented on how Brody's character was originally slated "to be the love interest for Lane," which then evolved to become his job. 7. The memorable band names they proposed were not ad-libbed. Lowe would not have listened to Follow Them to the Edge of the Desert. "Those were all the writers," Lowe said about the origin of the band names "The Harry Potters" and "Follow Them to the Edge of the Desert." "They were so strict on every comma, every period. To keep that pace. So that's all the writers coming up with those funny band names." Lowe also didn't think he would have listened to a band with the name his character proposed. That said, he thinks the band that inspired the joke -- And You Will Know Us by the Trail Of Dead -- is an "awesome band." There also wasn't original songwriting by the actors, although Lowe did try in the beginning. "I learned pretty early on that no, this is kind of Dan and Helen's pet project, and I completely trust myself in their hands," said Lowe. Lowe was in a fake German pop band at the time, however, and would often yell out, "Eins, zwei, drei, vier" -- or "one, two, three, four," in German -- before songs would start. This joke ended up getting written into the show. Perhaps getting an original intro to a song isn't the same as getting a whole song, but it's still something. 8. Lane Kim was based off Sherman-Palladino's friend, Helen Pai. Hep Alien is an anagram of Helen Pai. Helen Pai, co-producer and music supervisor for "Gilmore Girls," was also Sherman-Palladino's childhood friend and the basis for Lane Kim's character. She "really was a Seventh Day Adventist Korean, and Hep Alien is an anagram for Helen Pai," Lowe explained. Her husband is the aforementioned bass player, Dave Rygalski. 9. Rush frontman Geddy Lee made a secret cameo with his daughter as fans in the crowd at a Hep Alien show. Even Bach was starstruck. 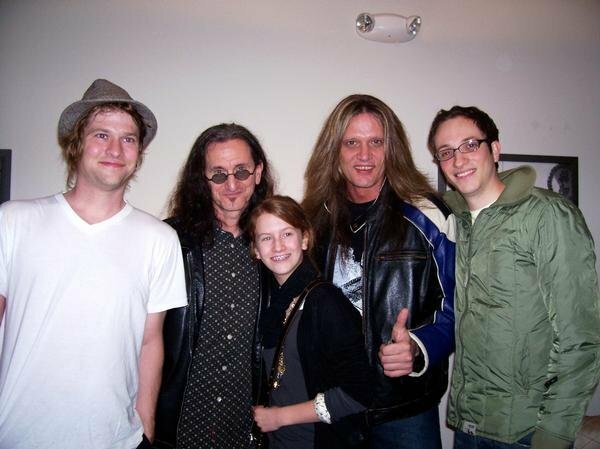 This is a memory that the members of Hep Alien still talk about, according to Cabrera, who explained that Geddy Lee's daughter "was a huge, huge fan of the show." "He came to the show and he was like a rock god, even to Sebastian, who was equally as starstruck having him there," said Cabrera. The rock god even helped Hep Alien with the song they were playing for the episode. 10. The cast imagined that Lane stuck with music after the show ended. In a previous HuffPost interview with Agena, she explained that she envisioned her character would continue to be creative. I know a lot of fans wanted to see more what would happen with Lane's music career. What did you think about Zach going on tour while Lane stays behind? It's interesting about motherhood. I have a friend who's a stylist. She's amazing to me because she has four young kids, but she is nonstop. She has her own business, her own career. She never quit that creative side of her. So maybe in my mind I think that Lane wouldn't have been able to stop that creative push. Because nothing was able to stop that, it didn't seem like it, in her storylines. It seems like after everything she did to keep that part of her alive growing up, it would be a shame if she didn't get to pursue that. "I think that she probably always keeps the music going," said Cabrera. Lowe also thought she'd keep up with it, but that his character's nature might have held things back. "If I was to speculate, there was probably financial hardship, maybe been a little marriage counseling," Lowe joked. "Zach wasn't the most mature guy, but I think in the end, he got his act together." BONUS: The band still hangs out, and are down for making a music video together. Hep Alien reunited at the ATX Festival back in June, and that might not be the last fans get to see the band perform. Agena, Cabrera and Lowe all expressed interest in doing a music video together. "If Warner Bros. signs up for it," Lowe explained. "We don't own the band at all. We don't own our character likenesses. I mean, we can play and perform, but we couldn't perform under Hep Alien." "I mean, that would be amazing if we did some sort of just crazy little Hep Alien music video. That I would love to do," Cabrera said. "You think The Huffington Post could help get the word out on something like that?" All television scenes: "Gilmore Girls." Other images: John Cabrera.